I am very pleasantly pleased with the vacation blog of a ninth grader of mine named Casey. Casey has had the rare opportunity to travel to many places that even I have not. She has wonderful, down to earth parents and I love her dearly. Her most recent post about New York is very good, I think, and I was hoping some of you who have been there recently (its been about 10 years a go for me) might post a comment. Stewart and I came in contact when the Westwood Wikispace was profiled by east wikkers as their #13 wiki and his Spectroscopy Wiki was profiled as the #14 wiki. He used campfire for the chat and I loved it. It has a great transcription feature and is easy to set up. I plan on using it in some of my classes next week. I hope you'll read the whole transcript, I have just pulled out a few highlights. Thank you, Stewart for such an enlightening discussion. Stewart M. What inspired the mashup on the front page of the wiki? Vicki D. To make things relevant to the students, I like to show it in action. We’ve been talking about mashups and some got it and some didn’t. We’ve also talked about RSS with the same result. When I did this, they all 100% got it becuase I did it in a way that is meaningful to them. They see the various sources and see how it is aggregated. There is nothing like a live example that is relevant to teach. Vicki D. I am encouraging them to mashup on their semester project using the RSS feed option added to Wikispaces recently. They can also look at my code and see how I did it to do it themselves. Stewart M. Yes - aggregating information vs. sharing answers is something I’m explaining quite often too - I think teachers need to be shown that aggregating information eliminates the useless repetition of basic facts that leaves them unengaged and the teachers with 20 identical papers to read. Vicki D. The only thing permanent in these kids lives is change. If we want them to be effective participators in this global community we must MODEL that behavior and change from CHANGE FIGHTERS to CHANGE MAKERS. Stewart M. I think that reaction is the clear indication of something revolutionary - they understand just enough to see it as completely different, but then they don’t know what to make of it. Vicki D. Absolutely revolutionary. It scared me to death. I had a humble little quiet project started with just the curriculum director involved and it literally erupted over the whole high school. Stewart M. This generation already is less resistant to change, in my opinion, and tools like the wiki enable them to do it in a tangible way. 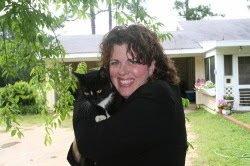 Vicki D. This generation is a generation of intuitive learners. The generation teaching them is a generation of TEXTBOOK learners. It has created friction. 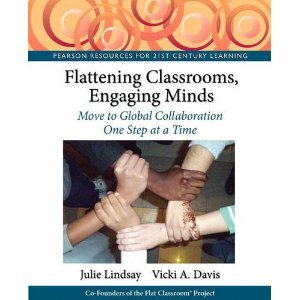 Vicki D. It has also created a missed opportunity for learning. Stewart M. That’s exactly the impetus behind my work - building tools that shift away from the traditional textbook model and allow both intuitive and participative learning. Vicki D. Intuitive learning combined with the power of Google and a wiki make for great socratic teaching without Socrates having to ask the questions - the students learn to ask their own questions. Vicki D. I think that your tools are desperately needed. I like the powerpoints and test banks that come with my textbooks but I want MORE. I want integrated tools such as wikis to record my best practices and learn from others. Vicki D. We’ve got to move from static material to dynamic material and I think most textbooks have made a poor attempt at this juncture. Stewart M. At times, teachers are so afraid they don’t allow students to contribute their own knowledge as they learn. I’m issuing a very provocative call in my next two speaking engagements in May to have students directly contribute to the spectroscopy wiki, and to do it in a manner that simulates peer-reviewed publishing in journals. Stewart M. There’s no reason not to have students learn in exactly the same environment and context that they will work professionally in. Vicki D. I think the traditional view of teachers is being challenged by these tools. After all, they think, the teacher is supposed to be the expert — in this rapidly changing world, the students can access new, relevant information that was once only accessible to the experts. Vicki D. They, therefore, should be included in the conversations that emerge. Why wikis have a place in the classroom. Stewart M. You’re right - and students WANT to do this. They’re already asking for it, and are willing and capable contributors. Vicki D. This is not about proving how much we know and feeding our own egos because society has marginalized teaching as a profession. This is about using methods that really TEACH. I think that is where the fear comes in. If teachers no longer “teach” are they needed. It is a redefinition of good teaching. Vicki D. Wikis ARE teaching! Wikis DO work! Students want to use social interaction as part of the learning process. They are more capable than we give them credit for. I've had some questions come lately about how I do assessments. I've integrated blogging and wikis into almost all of these. It is important to have "genuine" assessments which accurately reflect the knowledge of students. It is always a struggle to make sure we assess fairly but responsibly. Here is what four of my classes are doing this semester. Remember, as teachers we must be willing to do what is best for our students, not necessarily what we are used to. It was difficult to switch from "formal exams" but now that I have, I'm very happy and feel better the knowledge my students have. How to keep positive during May! May is a tough month for any educator I've ever known. As I was in the mountains last weekend, I contemplated my upcoming May and penned this little poem. Lord, please let me live through May. Lord, please help them live through May. not just biding time all day! as is each precious one. Lord, please let me teach through May! to make their cerebellum dance! to fan the flame and kindle a spark! I make a deposit in their mind. The use of "disruptive technologies" in a productive way. Mike Muir (hat tip to Doug Belshaw) has an incredible post entitled Fear and Disruptive Technologies in which he criticizes the knee jerk reactions of many educators to ban some potentially useful technologies such as: iPods, cell phones, etc. At his [Gary's] schools, about 95% of the students had cell phones. Did they ban their use? No. They purchased a system to push school announcements out to the phones. Some of the teachers use them for quizzes (kind of like the "clicker" student response systems). Now 100% of their students have cell phones. Their cell phone abuse rate? According to Gary, 0%. We were paying $3000 fifteen years a go to have the computing power of a cell phone in our classroom and now we ban cell phones? We're missing the boat. I don't think the applications are out there yet. We've started using meebo for reviews as they text each other questions and answers. We're using iPods to download podcasts and audiobooks from Librivox. I want to find a way to use cell phones to do virtual quizzes. This is not even the tip of the iceburg. We're spending time fighting students when we should be working with them. As a child, my Dad took me to swim in a very big river, the Flint river. It has a very strong current. Yes, it has snakes and alligators and the like, but you're usually safe at this certain bridge at "the Sandbar." Here is the trick he taught me -- He said, DO NOT WASTE YOUR TIME swimming against the current, it will wear you out! Let it take you a little and just try to swim towards the opposite bank. Eventually, you'll break out of the current and get there. That is also the rule at the beach if you're caught in the rip tide -- let it take you and swim parallel to shore until you break free. Why are we fighting this current? I feel like we're fighting a current here. There is a current of relevant, salient technology to these students that is not going away. I fear some administrators are going to go under fighting this one! Why not swim with the current and use these technologies to teach the subjects we hold dear? A lot of the "coolness" of the technology rubs off on the subject we're teaching! And I wonder why Gary Brown isn't blogging? Go wiggle your toes in the dirt! We can’t ignore that technology exist for this generation; what we need to do and learn is to balance the use of technology with good old fashion play. Maybe preschool students don’t need to watch a movie every day, or a 2nd grader doesn’t need a Gameboy. How do these activities help foster growth in students? Sure a Gameboy is great when you are traveling. It will keep a kid occupied for hours, but do they need to play it for hours when they get home from school? I agree totally! I live in the country for a reason. Although I did very well academically throughout my life, it is creativity that has always served me well and prospered me in most every career. Any succees we have, is rather partly attributable to what I call the "Wiggle your toes in the dirt" factor. I believe it is important to get out of the house and "do stuff." My favorite "stuff" is family time, fishing, running, frisbee, playing with the dogs, reading, talking, telling jokes, riding the Mule (a golf cart like contraption) through the farm, working on the farm, cooking, ping pong, taking pictures, pulling a weed or two and just "doing nothing" outside. Sometimes I just lay on the slide and look at the clouds or swing a little. These are the intangiable things that I believe are ESSENTIAL to the growth of my own children as well as my own happiness. Do you know what puts me in a good mood at this moment? The smell of jasmine that covers my entire yard. If I need a lift, I go outside and inhale that dreamy perfume. I've enjoyed looking at the clouds lately. They have been beautiful and white and fluffy. The other day it was pouring down rain and I let my two well children go play in it (My daughter just had a tonsilectomy) and jump in mud puddles until they were as brown as the bird dog! Life is so full of wonder and beauty. It is also full of amazing gadgets and toys. But it is in the diversity of things that I become ME and kids become above average. For me, it is when I wiggle my toes in the dirt that the cobwebs in my brain disengage on the breeze. So, get away from the TV, the laptop, the gadget and spend some time like Jeff does and many other greats outside doing "nothing." Perhaps why some of the blogging greats like Jeff and Kathy Sierra are so great is that they push their rolling chair away from the keyboard and get a little "non-screen time." Even more so, can you do that for the children in your sphere of influence? How to keep up with all of this blogging stuff using bloglines. This article is about the number one most useful thing a person can have today -- a news aggregator. News Aggregator or News Aggravator? It will be a news aggravator if you don't do it right. There is something relatively new on the web called RSS - (really simple syndication). It can be very confusing, however. I've tried several services and methods -- here is the easiest and best that I teach my students to use. I have found the best use of RSS is to sign up for an account like bloglines and subscribe to the information that interests you. Remember, use another password other than your e-mail password -- some folks think that is what they are asking for-- it is not! 4) Go into your account! The true power of bloglines though is in adding feeds. You can subscribe to this feed, for example. Here is the easiest way! I prefer to use the "Sub with Bloglines" button that I've conveniently placed on the toolbar of my web browser. Then, when I find a blog (like mine) that I want to subscribe to -- I can just click that button and it takes me through the process of adding the subscription. How do I add the Sub with Bloglines button? You will scroll down until you see the words Subscribe to It -- then a link that says "Subscribe with one click from your browser toolbar." Then you can go to my blog, or any other blog or page with RSS and add it to your bloglines account -- just click on the button on the toolbar. If you've just set up your account, and you are on my blog, just click Sub with Bloglines and it will give you a choice of feeds (I have five) -- unless you want the podcast chose any of them EXCEPT the Talkr one and voila -- cool cat in the bloglines account. If you want to find more blogs, look on the left side of my blog and find an educator blog that suits your fancy. Mine are sorted by recency so those who've posted lately are at the top of the list. After clicking "Sub with Bloglines" it will then ask you what folder to add it to and other information. I highly recommend making folders to organize your info. When you do that -- just click on the folder on the left that you have created and bloglines puts EVERYTHING in that folder together -- your news from the New York Times will be put in with the news from the WSJ and your Google news -- easy as Mrs. Smith's apple pie! Bloglines will notify you when there is new information -- just click and read. I particularly like the feature in google where you can make a search-- you can then subscribe to that search through Bloglines -- when new search information arises, you're there! I've done this with Google News -- I find it to be much more comprehensive than the New York Times and it links to all of the articles on that topic. 3) After claiming your blog, make sure you've logged into Technorati. 4) On the home page in the box that says "Search the blogosphere" type your URL (without the http.) and click Search. 5) The results of those who link to you will come up on the screen. In the top right corner is a button that says "Add to watchlist" Click it. 6) Once you've added your blog to your watchlist, Technorati will take you to a screen that shows the three most recent links to your URL. There is a little blue button that says RSS and beside it the words "view in RSS." Click that button. 7) A lot of computer "stuff" will appear but don't worry. Now, click the "Sub with Bloglines" button that you put on your browser. Put this subscription in a folder named "links to my blog" or something like that. Now, when you have links to your blog on technorati, they will appear automatically in bloglines in that folder. Go to the people who talk about you and comment and participate! Cool! This is just the tip of the iceberg. Try it and enjoy it! It is easy and it doesn't need to take a lot of time! There are lots of other RSS readers out there that will do these same things as well. Just comment with questions on this one and I'll answer! Let me know if you need help -- after all I'm a teacher at heart! Marshall K posted an interview with the editor of super-blog Lifehacker over at Net Squared. It's titled "On the care and feeding of a techno-garden: an interview with Lifehacker's Gina Trapani." Here are some great quotes I think everyone need to glean from this interview. For a transcript of the whole thing, visit NetSquared. Marshall K is a must-read! The other lesson that many for-profits haven't learned yet is to avoid drowning your employees in gadgets and tech - like Blackberries, laptops, and weekend email sessions - because constant connectivity and an interrupt-driven existence can really degrade people's morale and productivity levels. Amen! Sometimes it is great to get away. No telephone. No TV. No E-mail. Bloggers who go for years without missing a post any day are missing life! I believe in taking a break! On the editorial side, to build an audience, you need to post often. .. definitely update every day, if not twice a day. Your posts don't have to be long and thoughtful - though some should be - just summarize and point to a news item of the moment that's related to your nonprofit's area of interest. You want to establish a constant conversation about particular themes, and show that you're an authority on those themes, able to discuss them intelligently on an ongoing basis. Technically, take advantage of every single free resource out there on the web to reduce costs and technical issues. Use Creative Commons licensed or public domain images (we like http://everystockphoto.com). Host video at YouTube or the Internet Archive to avoid bandwidth costs. Odeo is perfect for podcasts. Use an open source CMS (like WordPress, or ask a hosting company like TypePad or WordPress.com to host your site for free in exchange for an ad. Marshall K, you've done the blogosphere a favor with this incredible interview! You've simply got to go read the whole thing! The fight for attitude preservation! As I think of this, I am reminded of my calling as a teacher. Educators may disagree on methods, practices, and such but the purpose is clear: the education of the future of the human race. As I cry and pray for these precious boys, it strikes a chord of nagging fear that I haven't done enough. Did I give enough attention? Did I show enough kindness? Did I kindle a spark of excitement that gave them something to look forward to in their day? Did I matter in their lives? "For it is the ultimate wisdom of the mountains that man is never so much a man as when he is striving for what is beyond his grasp, and that there is no battle worth winning save that against his own ignorance and fear." There was a frog and he fell in a hole in the middle of the road. He hopped and hopped and gave everything he had to get out of the hole. He wanted to go home and he was getting hungry. His friends came along, the turtle and the rabbit and tried to help. They put a stick in and tried to pull him out, they stuck the rabbit's fluffy tail over the edge for him to grab and pull himself out. But they just couldn't get him out of the hole. So they hopped and plodded off. Moments later they look up and the frog was hopping merrily along beside them. So, the frog struggled and remained in the hole until necessity required that he get out of the hole or cease to exist. As teachers sometimes we get in a "hole." We get tired and run down and frustrated. We are tired of grading. We are tired of kids! We are even tired of ourselves! We're just plain tired! However, as a teacher, there is a necessity for one of the vital ingredients of a good teacher: a good attitude. So is bad attitude. It is proven by research. The potential problem, though, is that these neurons go happily about their business of imitating others without our conscious intention. "Anger and resentment are the most contagious of emotions," according to Stonsy. "If you are near a resentful or angry person, you are more prone to become resentful or angry yourself. .."
I KNOW that the same anger and resentment that cause road rage can also cause a snowball effect in my classroom. You've seen it happen. A student comes in first period and is "ready to rumble." Suddenly you go from whistling "zip a de doo dah" to "zip your lip bud." People who think teaching is easy are not around teenagers very much! But my attitude affects that of every other person who comes into my room for the rest of the day. So, I cannot afford to let my attitude go south! Why are so many failing schools unable to turn it around? Well, attitudes can snowball and create an avalanche downhill! We are all inspired by the attitudes of those who motivate and stir the inner excitement in others. Legendary movies are made about such fictional or real teacher/ coach motivators - Mr. Holland's Opus , Remember the Titans , October Sky ... but as teachers watch, we are often skeptical that such people are not real. Surely we cannot expect to be purveyors of hope amidst the most difficult of circumstances. As educators, aren't we supposed to be realists? My husband bought the pilot of the new Battlestar Gallactica . At a pivotal moment at the end of the pilot, the 50,000 people remaining in the human race are standing at the funeral of many of their fallen comrades. They are despondent. They are lost. The billions of humans inhabiting 12 colonies (planets) are dead and they are all that is left. No place to resupply. Adrift. Their captain senses their feeling and in a moment of fanfare says that there is another colony that their enemy has not found and only he knows the way to get there. As you watch the faces of his crew, you see an enlightenment and excitement building. After he speaks and the funeral completes the crew erupts in applause and congratulatory hugs. Their hope is restored. They have something to work towards. They are part of something! The salvation of the human race! Although this pilot is science fiction, the concept of hope is not. As humans, we must know that there is hope. We must know that there is a point. We must know that struggle is for a reason and that it will not last forever. We must know there is a light in order to work towards the light. I would venture to say that every winning team I've ever seen won the battle of the mind before they ever stepped foot on the field. They may be unsure and know there was a struggle, but they had hope! I think of the rat in the cage experiment I learned about in one of my college Psychology classes. When rats have hope of avoiding shocks, they respond in basically Pavolovian ways to avoid the pain. But tie them down and shock them repeatedly without reason and they do not move. They hopelessly sit there and suffer. Even, when they are untied and all they have to do is move off of the shock sensor, they do not attempt to move. For in the process, they lost hope! Great administrators and leaders are vision casters who inspire real, believable hope. Sometimes they may doubt the possibility themselves, but never in front of their troops. I protect my hope. I protect my attitude. I cast the vision and let my students know there is hope. There is celebration after struggle. There is a reason for hard work! I am jumping out of the hole! So tonight, I remind myself of all of the good things I have. I remind myself of the progress that I've made with my kids. I remind myself of the private conversations I had with each of the two boys who now fight for their lives in hospital beds, too young to know that life is short. I remind myself that the other kids that will be in my classroom tomorrow need me more than ever. I will not put on a fake front or unreal sunny disposition. I will spend time praying to see what I should say to the kids tomorrow. They need adults to cry with them and encourage them. Not sugar coat it. But be real. They also need adults who know that there is a light and a believable hope in life. That at the darkest moments of life there is a Teacher who far surpasses me or any other in His ability to Teach them about such things. Life. Teaching. I traded a six figure income for a pittance of a salary. I traded a life making money for a life making true riches. I traded a life of self serving for a life of service to mankind. This is an excellent case study for those of us who teach ethics in our classes. I will be using it in my blog this week. Best-selling teenage author admits lifting parts of novel - The Herald: "
A teenage writer educated in Scotland last night admitted that passages in her best-selling debut novel had been borrowed from another book. Here is my question, what should be the consequences? If there are none, it will reinforce to our children that the ends justifies the means. 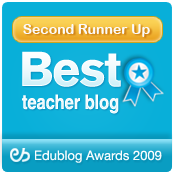 The mistaken identity of blogging: why educators are missing out! The groom and bride arrived exhausted at about 1 a.m. at the bridal suite at a posh hotel. They were exhausted from greeting friends and a long weekend of celebrations. Upon scanning the room, they saw the couch, a refrigerator, a table and chairs, the bathroom, and a closet. Too tired to think, they kept looking for the bed. They finally figured out that the couch had a pull out bed in it. All night they slept fitfully (among other things) on a lumpy, uncomfortable sofabed. In the morning, the bridegroom went down to the front desk to give them a piece of his mind about the terrible accommodations in their room. Quite confused, the manager took them to their room and went to the closet door. He opened what the couple thought was a closet door into the most lush, comfortable, intimate king sized bed along with now-lukewarm champagne, chocolates, and specially engraved glasses all set out for the couple. The couple missed out. All because of mistaken identity. Many educators are turning to the blogosphere as the salvation of writing. They are having students hand in their papers on blogs and do regular writing assignments on a blog! And then they groan because kids hate them! The teachers who jumped whole hog into blogging draw back dissillusioned! The newbie blogging teacher is frustrated with grading and wonders what the deal is! ... report findings from one of the first empirical studies exploring whether online writing offers a true pedagogical advantage over traditional writing projects submitted on paper. In Spring, 2005 a pilot study testing the effectiveness of blogs as compared to traditional papers in the classroom was conducted by the two authors. I do believe well-meaning teachers are trying to make the square peg of paper writing fit into the round hole of blogging. Yes, they both hinge upon writing, however, in my opinion, the mediums are decidedly different. Papers are best turned in on... well, paper. You can mark up errors on paper and correct things. You don't do that as well on blogs. There are some occasions where I have students turn in both a paper and post the paper on the weblog. This doesn't mean that I never turn papers in on the weblog, however, when the papers are done on weblogs, I have them add hyperlinks. NOT A replacement for message boards. Message boards have their place. While you can comment and do such on blogs. Sometimes, I don't think blogs are going to cause the obsolescence of message boards. They have a purpose too. NOT Something that will just sit there and run itself without teacher involvement. Not having to grade isn't here. In fact, I would say that something that runs without teacher involvement and monitoring points to only one thing -- a poor teacher. Teachers are integrated into every aspect of their classroom. It is not an easy profession, but a noble one for sure. NOT Benign, boring, documents without hyperlink or reference. Hyperlink, folks. That is the point! Naked posts are abandoned islands in a sea of knowledge. If you don't want hyperlinks, perhaps a traditional paper is what you're looking for. NOT be a place that reflects the sordid scum and dark side of society with profanity and unkindness. These types of blogs though they be from a PhD are from people who are, in my opinion, unprofessional and uneducated. Surely the flavorings of a varied vocabulary are the product of education. Profanity reeks of the first grader stomping their foot and calling someone "stupid' because they cannot win an argument. Profanity precludes a massive audience from reading your work! For knowledge creation, blogging fuels that "love of the game." ARE A Part of a Conversation - If a person only posts on a topic and never comments on another blog, they have missed half of the experience. Be a part of the conversation about your passion and topic! Besides, over half of my traffic is driven by comments. Don't be afraid you're giving away "secrets!" If your comment is that good, copy and post it back on your blog and trackback to the original article. That is conversation! ARE A tool to Extend Class conversation outside the classroom - The power of blogs is in assigning common topics and contributing to and guiding the conversation that emerges. Participate in the conversation by commenting on student blogs yourself and posting blog entries that synthesize and summarize what students say. ARE the production of rich hypertext documents for sharing and conversing about information. A blog post without a hyperlink is a dead document. Hyperlinking is an essential skill, and I believe students should know how to do it manually in HTML. It is that important! ARE A place where decision makers and influencers are looking to spot trends and opinions at first ripple. I think teachers who take exactly what they are doing with paper and transpose that to a blog will be sadly dissapointed. If you want to pull assignments out of kids almost against their will, assign papers. If you want students to enjoy posting and conversing about meaningful topics, blog and wiki. Blogs are not the same thing as a paper. They weren't intended to be. They never will be. There is a place for both. However, teachers have got the potential to create exciting, innovative conversations online have got to look into blogs and and wikis to use them in the best way possible. Blogs and wikis are meaningful, salient modes of communication to students. Shouldn't we use it to talk about History, English, Science, Math, and Computer Science? Do we know what the best practices are in blogging yet? However, while there is much discussion about the potential benefits of these tools, more work is needed to assess their impacts and identify best teaching practices. I don't want to be redundant, so here are some of the most popular cool cat teacher blogs on these two topics. Wikis and blogs this week: March 13 - Light the Match! My Favorite Tools in the Classroom -- What are yours? If you want to get started and love books (like me), I suggest reading David Warlick's book, Blogging in the Classroom, that is how I got started! I also see that Will Richardson’s book, Blogs, Wikis, Podcasts and Other Powerful Web Tools for Classrooms is getting great reviews from educators, but I haven't read it yet. He's such a great blogger, that I'm sure its a good one and it is on my next to order and read list. Blogging and wikis are a communication METHOD not a threat! What should we be doing? Teaching our kids through the use of POV. (Point of View) Getting our kids involved in the local, national and international community through the power of technology. Developing school systems that support and develop effective teachers. It is true, technology is their life - so let’s embrace that fact and find ways to help OUR kids think more effectively within that environment. Bottom line on blogging in the classroom. We should be using blogs in the correct way to enhance teaching. They do not necessarily replace papers, but add a whole new aspect to teaching! If you do not see blogs for the opportunity that they really are, you will wake up in the morning, like the honeymooning couple and realize that you missed out because you did not recognize the true identity of the door that leads to the blogosphere. Even worse, your students will have missed out! Finally, I have been taken to task for my lack of research. I, however, am a classroom teacher. My research is in the eyes of my students. I observe, I watch, and I experiment. The intent of my blog is to share with you what I have observed and found to be true in a real classroom that is using blogs, wikis, podcasts, and most any Web 2.0 technology we can get our clickers upon. Do not let me discourage you from trying something you think may work in your classroom, I look forward to seeing what you think and observe in your classroom until those who are doing the research can effectively measure and understand this new medium we are all grappling to get our arms around! People who care blog! The facts to prove it! Dave Sifry has posted his quarterly State of the Blogosphere on Technorati. It is fascinating! The blogosphere tends to double every 6 months. The blogosphere is 60 times bigger than 3 years a go. Fifty five per cent (55%) of bloggers are still blogging after 3 months. A new web log is created every second. Eleven per cent (11%) of blogs update weekly or more. By adding to the diversity of original content, weblogs have added a whole new layer to the Media Food chain. That puts weblogs at the base of the food chain, generating the sort of grassroots journalism that the new Media Ecosystem has grown increasingly dependent upon. In a world where over half the media outlets are controlled by six corporations, that sort of diversity of perspective is becoming increasingly important. John also talks about community blogs -- I would include my favorites: digg, and slashdot. These community blogs create good information because people submit articles and then rank them, thus it is a human-filtration type of index. Taking the information from Dave Sifry and the incredibly insightful article from John, here are several conclusions I have for you as a blogger. Consistent bloggers (that 11% who updates at least once a week) have an inordinate amount of influence compared to the average person in America. Everyone has opinions. Bloggers log those opinions. Those opinions act like "votes" and are counted! Bloggers who are smart have even more influence: they ping, they attach keywords to their post, and they submit articles and participate in community blogs such as dig. These habits of successful bloggers make sure that your opinion is found and considered by others. It is one thing to have opinion, it is another thing to make it count. So, if you CARE, if you WANT TO MAKE A DIFFERENCE, if you are passionate, there is an outlet for you besides unconstructive temper tantrums: YOU BLOG! So, teacher, let's take this one step further. If you want your student's opinion to count, how can you best help them have this influence and effectiveness? TEACH THEM TO BLOG EFFECTIVELY! Makes sense. No, I'm not talking about seducing your students! I'm talking about Kathy's Sierra's newest mind blowing post entitled, Cognitive Seduction (a Typology of User Experience Pleasures) in which Kathy profiles several books including the book Rules of Play, by Katie Salen and Eric Zimmerman. In this book, game designer Marc LeBlanc defines 8 categories of experiences in a "typology of pleasure". Kathy summarizes them for those who design experiences for users in the corporate world. I'd like to take this Typology of User Experience Pleasures and put them in the context of the classroom. These are the things about games that make them so addictive to students. We must use them to addict them to lifelong learning. Kathy Sierra is unbelievable! This is why Socratic teaching is so very powerful, in my opinion. When you teach by asking questions, the STUDENT gets the light bulb experience. Even if the question is leading, they have the cognizance that THEY discovered it. THEY brought it to light. THEY then take it places I never could if I was just lecturing. You must get past the "helpless handraising" that you enable when you tell students everything. If you only teach students to follow instructions in a book, then guess what? You've taught them to read instructions in a book. Again, producing mindless robots fit for a production line but not for the new thinking skills required to keep America competitive! Push them to intuitive learning. Force them to use "hot tips" in Microsoft Office and use the help features and go online to find answers. Challenge them and push them a little past what they know how to do. Give them just enough information and push them past it. Don't just tell them all the answers, guide them. Under no circumstances are you to ever touch, move, or enter any input into the mouse or keyboard of your student. Never allow them to do it for one another. It is theirs. If I show them by doing it, I undo and then save. This makes it so they cannot just redo. They must learn by doing! I am grouping #3 and #4 together because I believe that blogging as something that is read but also something that is written follow so very well into these. For example, blogging your experiences and your journey through a new technology chronicles your opinions, your progression, and reminds you that if you journeyed through ignorance to knowledge once that you can do it again. Blogging about literature and commenting on others who are doing the same creates online conversation. Wikis and blogs key in on this beautifully! Whether it is worldwide collaboration on projects such as wikiville or class collaboration and projects, the social aspect of wikis and blogs is evident and powerful. It is also being unused by most classrooms! I think this is what we're missing. We have kids' bodies in the chairs but their minds are somewhere else. Hasn't that always been the problem? More powerful than a computer, stronger than a textbook, more able than a curriculum to excite and ignite the spark of passion for learning and advancement in a child: a good teacher! You can also cognitively arouse by engaging not only all of the senses used by a child but also all of the gadgets used by a child. I believe that the future of education is in the palm of our hands: our cell phones, our iPods, our leapsters, our cameras, our PDA's, our laptops. We've spent all our time telling kids they shouldn't bring these things to school when we should tell them -- "Bring it on and let me show you how to use them to learn." I show auditory learners how to download books from librivox. I'd like to have a website that would work will cell phone text messaging. Then, when I'm doing presentations, the kids could use their cell phones to text the answer to the number. The website would then update and show their responses on my board. This would save money on expensive clickers. There could be extra "devices" to be used for those who don't have the phones. Don't fight them, use them! I'm a renegade and I admit it. I use cell phones, iPods, microphones, PDA's, and all of those things in classroom instruction. We e-mail photos taken by cell phones for use in portfolios. We podcast and download reviews into iPods. Goodness folks, we have the world at our fingertips and we won't let them bring it to class because we don't know how to use them! We're letting the ignorance of education prevent the learning of our students! There is more computing power in a cell phone than we had in computers 15 years a go! Students, we're going to talk about Web 2.0 but I want you to tell me what it is. I've taken five web 2.0 terms and posted them on the wiki. Here are your groups, explore. You will make a wiki about what you find. You will use the technology and you will demonstration to the class in two days. GO! That is why my kids are fired up about what is happening on the Internet. The THRILL that they discovered it themselves. That is what you don't get with lecture! Involve all of the senses: touch, sight, hearing, and yes, even taste and smell. Do you know how I teach the students to participate in Socratic discussions. (Some of you will hate this and criticize me greatly!) I use food. I have the Mrs. Vicki candy bucket at the front of the room and I almost go broke keeping it stocked. At certain times and heavily at the beginning of the year (partial reinforcement works best), I pull out the bucket. When we discuss and they give a meaningful answer, I throw the candy to them and let them eat it right there! They laugh because it is funny seeing me and my noodle arm throw the candy, but they love it! Each student gets one piece only and they don't get any next time if I find a wrapper on the desk. As I go along, I ask who hasn't gotten their candy yet and they are only too eager to participate. Make fun of me all you want, but the best teachers I know all use food as a motivator. I also have my big "parties" once or twice a year for each class. We eat and cogitate about lessons learned or celebrate big accomplishments. (Like our portfolio party coming up the day after portfolios are due.) This works well in adult classes too! This means I have to get approval from administration and move to another location on campus, but we do it! Taste and smell motivate as do the other sensory organs. Involve them! I did it and I was awesome! Honest, sincere praise is the most amazing and free motivator known to man. My senior Graphic Design students just finished their ad campaigns. I promptly got a table and displayed their work in the hall. They are so proud because their work is unbelievable! This is also where celebrations -- BIG ONES make a difference. This is like the "steak out" I do for my eighth grade when they've finished the keyboard. This is like the SAT party we have after we take the test! The greatest pleasure of a sporting event is after you've won, lying exhausted on the field, knowing you gave it all, and it was enough! You've won! We've got to give kids that exhiliaration on a weekly, continuing, ongoing basis. Grading papers tells them what they've MISSED. Try this experiment. Check all of the answers they get right and mark nothing on those they get wrong. Still give them the same grade they would have made otherwise. See what they do! I do this every so often and the kids love it! My kids have a sense of triumph because they are doing something with Web 2.0 that their friends at other schools know nothing about. College kids are calling my ninth and tenth graders asking for help with wikis and blogs. They are part of something that transcends them. We call finding Web 2.0 our "happy accident of the year." Give your kids a sense of triumph. That is what graphing the GWAM of my 8th graders did. I give high fives, candy, etc. That is what pies in the face, and cutting off ties, and shaving heads of administrators and teachers do. Triumph! A ha! I did something great! Get creative and figure it out! In the greatest experiences of class, my students will say when the bell rings, "Is that the bell, is class over?" Yesterday, we were talking about Web 2.0 and evaluating the teen vogue website for our class ranking project (using the awesome Intel thinking tools), the bell rang and NONE of us noticed. We talked for about 2 minutes until the kids from the next class knocked. We were in a flow, engaged, and excited. Dr. Eugene Griessman, one of my favorite college professors, often talked of the flow state as an attribute of high achievers! We need to harness these aspects of cognitive seduction and use them to make Cognitive SEDUCT-ucation. We're fighting the technologies that can open the minds of these kids! Wake up educators and thank you, Kathy, you're not only creating passionate users, you are creating a passionate teacher! How to be better at everything you do! As parents flock to myspace it becomes uncool?